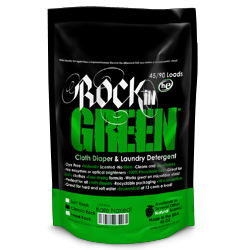 Why you want this prize: Rockin’ Green makes an awesome detergent, and specializes in a product specifically designed for those of us with hard water issues (Hard Rock formula). With their great natural scents, they are a go-to choice for cloth diaper users. Details: winner will be chosen using a random number generator. Deadline for last “comment” is Friday, July 23 , at 9 p.m. PST. Winner to be posted Monday, July 26, before noon and has 72 hours to claim prize. If no response, a new winner will be selected and announced the next day. Entry filed under: Weekly giveaways. Tags: giveaways, Rockin' Green. I’m not sure it’s a secret, but line drying! I’m a BIG fan of drying my diapers outside in the sun shine!! It helps kill bacteria and leave my cloth smelling so fresh and clean. my prefolds get really stuff when I line dry. suggestions? Rinse, rinse, rinse! I’m battling with a front loader myself right now and just continually washing (once with detergent and several follow ups without) is the only way I seem to be dealing with it. I can’t wait to have my own washer again!! Laundry tips? Well… I run it for 3 cycles. Not just rinse, but full on cycle. Then I hang dry on my brand-spankin new clothes line outside… woo-hoo! I like Mothering Grace on FB! I don’t have any experience with a front loader, but a tip for RNG is to always reseal the bag completely between washes, otherwise you lose your scents. Also, as a general tip, when line drying, I attach the diaper covers/pockets in a good diaper chain. 🙂 I hang one cover on the line, then attach a couple more in a chain vertically. This saves on the amount of clothes line that I use up so I have enough available for everything else! There are some good tips here! I have pretty hard water, and so far my only solution has been to use more detergent, alas. I’m about to try hard rock rockin green though, so we shall see! I’m not sure about a frontloader but Calgon always helped with hard water for me. I just added 1/4 cup to my wash cycle with the detergent. I found that with my hard water it really helped to add a little Calgon every few washes. At the time, I was using soap nuts exclusively, which I liked, but after awhile I started getting ammonia stink, and the Calgon really helped! I have no laundry tips! I don’t have a frontloader, and our water isn’t a problem, fortunately. We use Rockin Green with our front loader and I make sure to run 2 extra rinses at the end. The “problem” with our washer is that it uses the smallest amount of water possible so I have to do extra rinses for all of the soap and yuckies to come out of cloth diapers. definitely rinsing as much as you can! I also love to line dry! I have been battling the front loader- hard water dilemma since day 1! The only difference is, in the beginning when I was clueless, we didn’t seem to have the same troubles we do now! My current plan of attack is: cold/ cold rinse cycle with extra rinse, cold/ cold heavy soil cycle with detergent, prewash and extra rinse, at least 2 hot/ cold cycles with no detergant and extra rinse and then 1 or more rinse cycles for good measure. If possible, I hang everything outside on the clothesline and then fluff for 5 min in the dryer so it isn’t too crusty. I have always heard to put a towel in with the diapers. In theory, it is supposed to raise the water level; but I don’t feel the diapers would get washed properly with it in there. I look forward to reading other suggestions! I don’t have a secret laundry idea to share. We are just finishing our second week of cloth diapers. However, I would LOVE the chance to win some Rockin’ Green! my laundry secret? the cold rinse!! my diapers would be a mess without it. I don’t have a front loader but do have an HE washer. I wonder if not having an agitator in the middle means less clean? Hmmm, we have LG front loaders, about 6 years old so unlike the newer models, there’s no “extra water” setting. so one of the tips we’ve found that works to GET more water in, since apparently the water level is based on weight is to throw in a sopping wet towel with the regular wash. Then it’s the regular cold prerinse, hot/cold wash cycle and extra rinse, I think I hit the super stain setting and it’s on heavy soil, nearly 2 hours to wash, but that’s what it takes! We use 1/2 -2/3 scoop of Hard Rock and the diapers come out pretty darn clean. They say we don’t have hard water around here, but I’m not sure…. 3) add your soap and run the load. (the diapers will be xtra heavy with the no spin option which “tricks” the washer into using more water 🙂 Be sure to add an extra rinse! Hmm…I hoping Rockin green will solve my issues (HE and hard water too). My CD’s just aren’t getting clean enough for my liking. I love my clothes line! It’s the best way to keep my clothes fresh and stain free! We just started cloth last week, so we haven’t run into too many problems…. I just have to do laundry every day as I don’t have enough yet to wash every other. I have my own dilemma we discovered yesterday. Our 18 mos dd has “ruined” a cover it looks like…..she was playing in mulch and water and dirt sans pants as it was hot, so now her diaper cover is looking like the outside is never going to come clean. I’ve washed it once with Charlie’s soap, but it didn’t come out. I have a feeling our tomboy monkey girl isn’t going to change anytime soon, so I need to find a solution or we won’t have any diapers for the new baby due in November…..ugh. I absolutely LOVE Rock’n Green. I kept trying the other suggested detergents but had very strong ammonia smell. Rock’n Green took the funk outta my SoftBums. I heard that tossing a dry towel in with the wet clothes/diapers cuts down your drying time, and it does! I have a small towel that now lives in my dryer and goes in with every load. Not sure if its a tip or not but since I have a front loader if I need to Rock a Soak I put my diapers in the tub overnight. I have no advice for using a front loader. But my best tips are line drying outside (best for getting out stains) and spraying poopy diapers with the diaper sprayer, followed by a spray of BacOut. This keeps my diapers from getting smelly and gross! i do lots of extra rinses with my hard water and front loader. and a third cold rinse for posterity’s sake! i “like” mothering grace on facebook. rockin’ green hard rock is the BEST for hard water. I HAVE to add a towel to the washer and the dryer or I get residual smell to my diapers. I don’t own a front loader, but my best laundry tips is a cold rinse with vinegar and then 2 tbsp. of Lulu in the Fluff’s Glamour Wash. It works well for us! My secret laundry tip is to use an outstanding detergent like Rockin Green! I like Mothering Grace on FB. I put a wet towel in the fl with my diapers (this get me the heaviest load) for more water and do a cold rinse first. Then I wash with a small amount of detergent on a hot/cold or warm full cycle plus extra rinse. I don’t have any personal tips but I have friends with hard water and they all use Hard Rock Rockin’ Green Soap on their cloth diapers. rinse rinse RINSE!! lol I do cold with det., hot with det., then just a plain rinse cycle – no detergent then LINE dry out n this HEAT – nice yummy ( can u say this with diapers!!?? lol) diapers for my baby boys tush! thank u!! I get yo emails tooo!!! thanks!! I don’t have a front loader. I like to scrub stains out the best I can once they happen with a bit of hand soap. I don’t have any cloth specific laundry secrets – yet! Baby doesn’t arrive till september. But with general laundry its all about the spin cycle for me – reduce drying time and save energy. Ooh, I love all the tips! In my frontloader I throw a soaking wet towel in with my diapers then I do a rinse, wash and rinse again then I line dry if the weather cooperates. I use BacOut in the initial rinse to get rid of stains and help with the ammonia smell. Make sure you rinse enough! So I am looking for tips too. Best I’ve heard is Sun Sun Sun and oxygen bleach no chlorine. I’m just starting, so I don’t have too many tips, but spraying the messy diapers and doing an extra rinse when laundering is very helpful!